There’s a delightful curriculum about Africa that does it justice—instead of lightly touching on the continent. Ann M. Jansen’s GeoDeo Journey Into Africa curriculum is a multi-level unit study with a Christian perspective that is reasonably priced and has professional quality components. 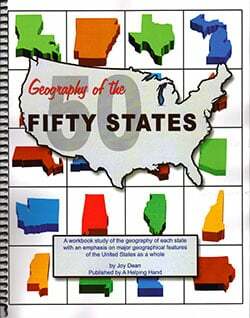 Though out of print, we still have some of the main components available. The main book you need is the Journey into Africa Resource Book. The Student Worksheets are available in E-book format. We also have some of the CDs and coloring books. You need this basic building block to use the GeoDeo Journey into Africa curriculum. The Journey Into Africa Resource Book is also a helpful supplement to any geography curriculum. 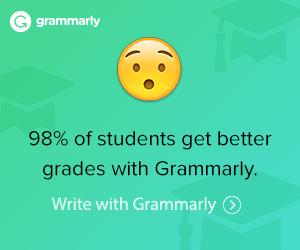 Student Worksheets in PDF ebook format are available for grades 2-5 and 5-8. With 88 pages, the Journey Into Africa How to Draw and Color book has instructions for drawing African animals. Step-by-step instructions for drawing 19 different animals are given with sample drawings. Unique to this book are the detailed “how to color” steps which produce beautiful results with colored pencils. How to Color and Draw is recommended for use with the Journey Into Africa program, but it can stand-alone for use this with any study of Africa and adds art and science to the study. 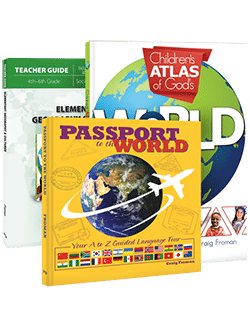 The Journey Into Africa Reproducible Student Worksheets for Grades 2-5 are now sold separately from the Instructor’s Manual. We will email the worksheets as a PDF file. You can open on your computer with the free Adobe Reader to view and print as needed for your family. Please allow a couple of days to receive it and check your sp*am folder. 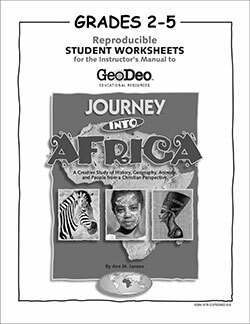 The Journey Into Africa Reproducible Student Worksheets for Grades 5-8 are now sold separately from the Instructor’s Manual. You’ll find over 46 pages of coloring and activities about Africa. On the inside covers, there are small color pictures of how each coloring page should be colored. That’s helpful. Reproducible for single classroom use. Journey Into Africa Songs CD includes 18 traditional and original songs that teach about Africa. The variety of singers and songs make this a very ear-pleasing and instructional CD. The song tunes are catchy and the recording is of professional quality. If you are studying Africa, this CD is a great addition and adds a music component. The Journey Into Africa Rhythms Improvising CD is neat for learning about rhythms. There’s information about getting free lesson plans to use with this CD. I listened to various samples and am off to get the free lesson plans for use with our sons who love drums! Again this CD was professionally recorded with high quality and the speaker/instructor’ voice and the various music samples are pleasing to the ear. Good listening for drives in the car. I’m listening to the Journey Into Africa Rhythms CD as I write this page, and I think children will have fun with the rhythm activities on it. No dull moments with this one! Our 16-year-old daughter just walked in to ask a question about the meal she’s preparing and walked away clapping to the CD! That’s a good sign. These 240 Review Cards are a key element in helping students retain information learned in the GeoDeo Journey Into Africa™ Resource Book. The cards can be used as trivia questions with any African study or with games like baseball and Jeopardy. You’ll need something for storage once you open them as they are simply shrink wrapped. One idea is to use a sturdy re-sealable plastic bag or a small box with rubber bands around the cards.